As described in Chapter 2, it takes a large and very expensive rocket to launch even a relatively small satellite. The launch is also often the most risky part of a space mission; even today a commercial launcher has typically between a 1 and 3 percent chance of blowing up, depending on the type and reliability of the launcher. This may not seem to be too bad, but if one in a hundred aircraft would come falling from the sky every day, the ground would be littered with burning aircraft wreckage. Economic, safe, and routine air travel would be impossible. Something radically new is needed to provide the reliable, low-cost access to space that spaceflight engineers, scientists, and other enthusiasts have been dreaming about for the last hundred years. Constructing a space elevator will undoubtedly be an extremely difficult and expensive endeavor, but if the gains outweigh the investments it will be worth doing. In addition to their use for launching materials into space, such installations could support laboratories for observation of conditions in space at high altitudes; they could resupply energy or materials to satellites or spacecraft, collect energy or materials from space and the high atmosphere, support very tall structures on the earth's surface, and others. There is no immediate limit to the total mass that could be retained near the one-day orbit by such a cable. The primary use of a space elevator will probably be the delivery of satellites into space. Not taking into account the initial cost of development and construction, a space elevator could dramatically lower the recurring cost of launching a satellite. In terms of electrical power required to transport cargo up a space elevator, the cost could be less than ten dollars per kilogram. This is tiny compared to the current price for a launch, which ranges from $5000 to $10,000 per kilogram. It is likely that for each satellite an amortization fee will be added to the bare launch price, in order to pay back the investments for building the space elevator. In addition, there will be costs associated with the operation and maintenance of the space elevator system. However, if enough satellites are launched, the price per launch can still be much lower than is currently the case. In addition, the cost for a space elevator may be shared with clients for other applications, such as microgravity industries and space tourism. It is very likely that the demand for spacecraft launches will increase dramatically once prices for putting them in orbit drop significantly; more and more organizations and countries will be able to afford space missions, and more people will find ways to make money from the use of satellites and space applications. Moreover, for similar budgets now required to launch a couple of interplanetary probes per decade, we could send out a steady stream of continually improved spacecraft to investigate other planets. Elevator-deployed satellites could also be much larger and therefore more capable than now, because they could be transported up in sufficiently small elements that are subsequently assembled at the orbital station. Extending this concept will make it possible to construct large-scale systems in orbit from parts prefabricated on Earth and transported into space by the elevator. These could include giant radio telescopes, solar collectors for generating power and transmitting it to Earth, and large crewed interplanetary exploration vehicles. Instead of replacing entire satellites because of relatively small but important malfunctions or depletion of attitude control propellant, geostationary satellites could be moved back to the space elevator station for repair, refueling, or even modification. Currently, maintenance on satellites happens very rarely, due to the high cost for crewed space missions (the Space Shuttle has only occasionally been used for orbital repair work, most notably on the Hubble Space Telescope). Spacecraft can also be entirely returned to Earth using the space elevator. Space probes normally require heat shields and parachutes to reenter Earth's atmosphere and make a soft landing. If they could dock to the space elevator in space and be gently transported down, there would be no need for heavy reentry and parachute systems, and it would also be much easier to reuse the spacecraft afterward (heat shields can normally be used only once, and even the reusable tiles of the Space Shuttle require a lot of repair after every flight). Another potentially important application is industrial manufacturing inside the main station. The microgravity conditions there would allow new types of alloys of metals that do not mix under gravity conditions due to differences in density (on Earth, lighter melted metals float on top of denser materials). Also interesting is the growth of crystals that are larger and more pure than those manufactured on Earth, where buoyancy-driven convection in liquids has a disturbing influence. Such crystals have many uses in medicine and electronics. Despite high expectations in the 1970s and 1980s, commercial microgravity manufacturing has never taken off because of the high cost for launching raw materials into space, astronaut labor, and return of products to Earth. However, a space elevator could make space industries profitable. The geostationary point could also be the location for a space hotel, providing an affordable and fascinating new holiday destination. Guests could enjoy weightlessness and observe Earth from space, which they would be able to see as a complete globe from the geostationary point at an altitude of 36,000 km (22,000 miles). The trip up the elevator inside a suitably comfortable cabin would be long, but an adventure in itself. Space tourists would slowly see the horizon start to curve and finally form a complete circle. At the same time they would slowly lose weight, reaching microgravity conditions at the geostationary point. Space hotels and other crewed facilities could alternatively be built somewhat below or above the geostationary point, as a tiny level of gravity would facilitate sleeping, washing, and eating, and may alleviate typical physiological microgravity problems such as space sickness, muscle atrophy, and bone loss. Below the geostationary point people would stand with their feet pointing toward Earth, as gravity would be slightly higher than the compensating centrifugal force. However, above the geostationary point the centrifugal force is stronger; when people stand, the Earth would consequently always be straight over their head. 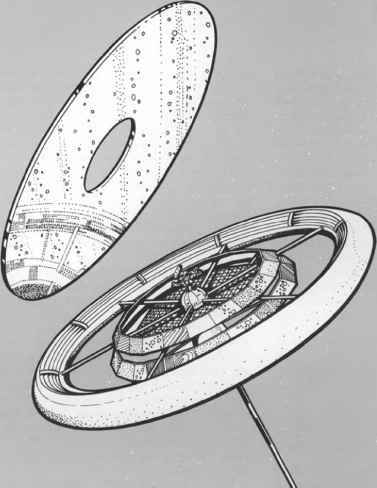 principle can be placed anywhere along the space elevator ribbon, making it possible to put them close to the ground and thus increase their resolution (as the same instrument will be able to see more details than from geosynchronous orbit [GEO] altitude). Instruments placed at intervals on the ribbon will also enable detailed studies of Earth's upper atmosphere and near-space environment. Some people are so confident that we will be able to build a space elevator in the near future that they are already trying to make a business out of it. The LiftPort Group, founded in April 2003, is a group of small companies in the United States dedicated to building a space elevator. Their goal is "to provide the world a mass transportation system to open up the vast market opportunities that exist in space, many of which haven't even been imagined yet, to even the smallest entrepreneur.'' 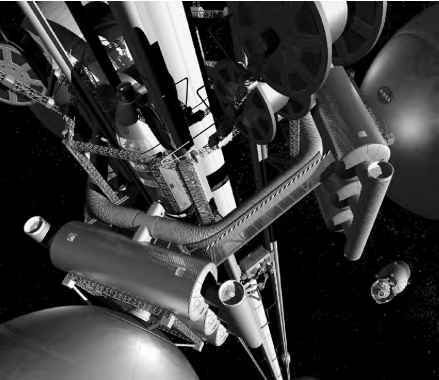 The group focuses on developing the hardware of the space elevator, including such fields as carbon nanotube production and climber/lifter technology, and challenges such as how to connect the space elevator tether to Earth. The group's motto is "Change the world or go home.'' While developing space elevator equipment, LiftPort is earning income on related technology, such as balloon-borne observation and telecommunication platforms based on the high-altitude balloons they use to raise long tethers for climber/lifter tests. The space elevator concept is also serious business to the professionals and space enthusiasts gathered for the International Conference on the Space Elevator in 2002,2003,2004, and 2008 in the United States, and in 2007 for the First European Workshop on Space Elevator Climber and Tether Design in Luxembourg. The purpose of these conferences is "to bring together scientists, engineers, businessmen, economists, educators, financiers, writers, students, and others interested in the Space Elevator for wideranging papers and discussion sessions,'' according to the announcement for the 2008 conference on the Microsoft campus in Redmond, Washington. On the other side of the world, the Japan Space Elevator Association (JSEA) is seriously studying and promoting the concept. The group hosted a space elevator conference in Japan in 2008 and endeavors to launch its own space elevator games in 2009. Clearly the space elevator is moving out of the realm of pure science fiction.